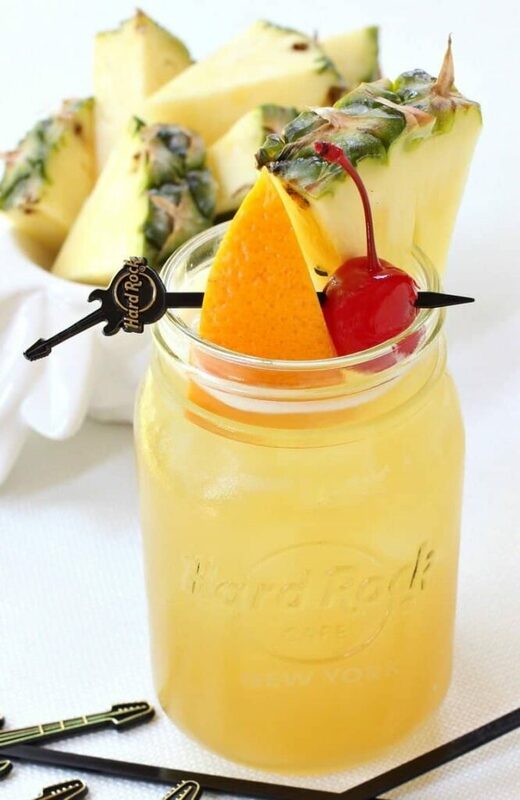 This All Jacked Up cocktail from Hard Rock Cafe was the perfect drink to wash down all those burgers I sampled from their World Burger Tour menu! All Jacked Up. 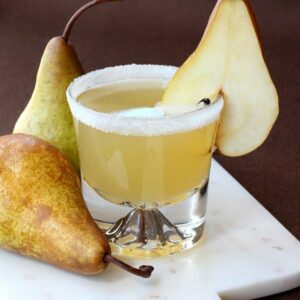 What an awesome name for a cocktail. 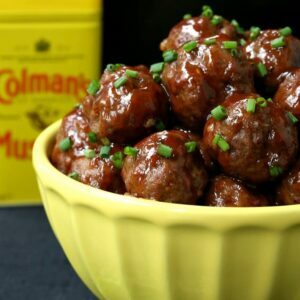 And the taste was just as good – so good I wanted to recreate it so I could share it with you. 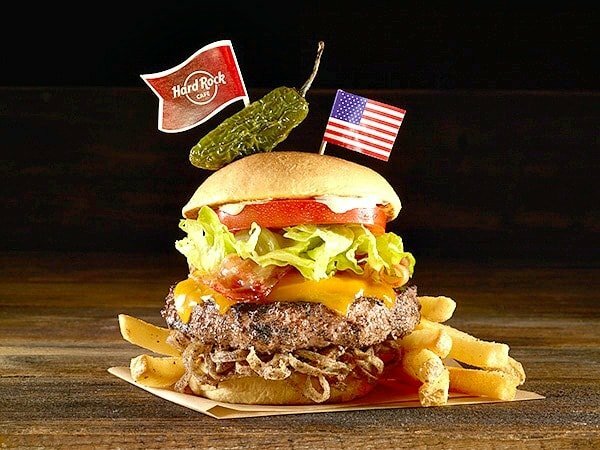 I was invited to head out to Hard Rock Cafe in Times Square to sample the new World Burger Tour menu – And I mean the WHOLE menu! Not a bad gig I know, but it does takes some talent to get all those burgers down, I have to say. 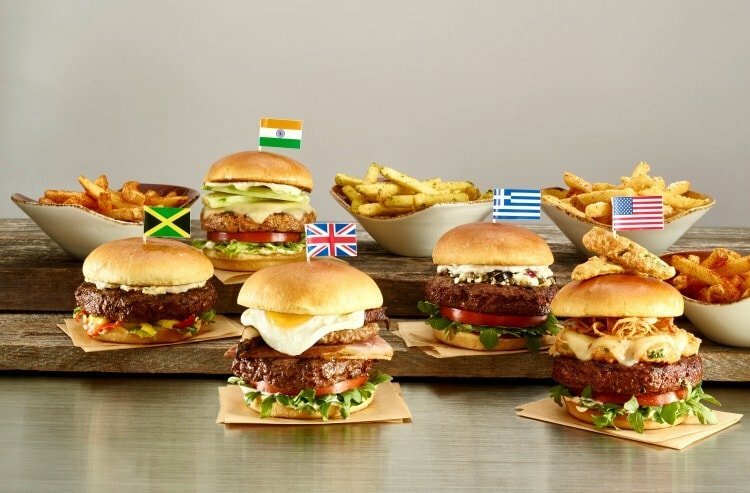 Jamaican Jerk Burger, a Tandoori Chicken Burger, a Java Lava Burger, an English Breakfast Burger and an Athens Greek Burger. All were off the wall amazing, but I’ll tell you what my favorites were…. I had to grab a friend of mine, Elliot to head in with me and sample all these burger creations. I knew this guy could handle all the samplings of the burgers and cocktails Hard Rock was going to throw at us that day. Because you HAVE to taste them all, right? His favorite was the English Breakfast Burger, no surprise since he’s from England, but he really loved this one. It’s a beef hamburger topped with ham, a sausage patty and a fried egg. And on top of that is a portobello mushroom, arugula and garlic aioli. My favorite of the day turned out to be the Java Lava Burger. Which is kind of funny since I’m not a coffee drinker, but this burger was insane…a beef burger rubbed with a house made espresso rub, topped with lava sauce, crunchy java onions, bacon, melted cheddar cheese and a fried jalapeño. Yeah, don’t worry, we ate the other burgers too. 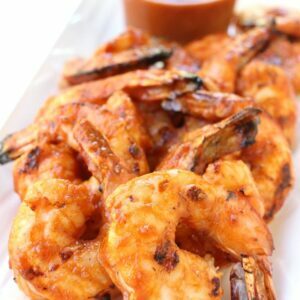 They were all really creative – and really tasty. Then we needed to get up and do some walking. After what we ate we could have walked back to Jersey and still not walked it all off…but there was rock n’ roll memorabilia to look at and I wasn’t passing that up. 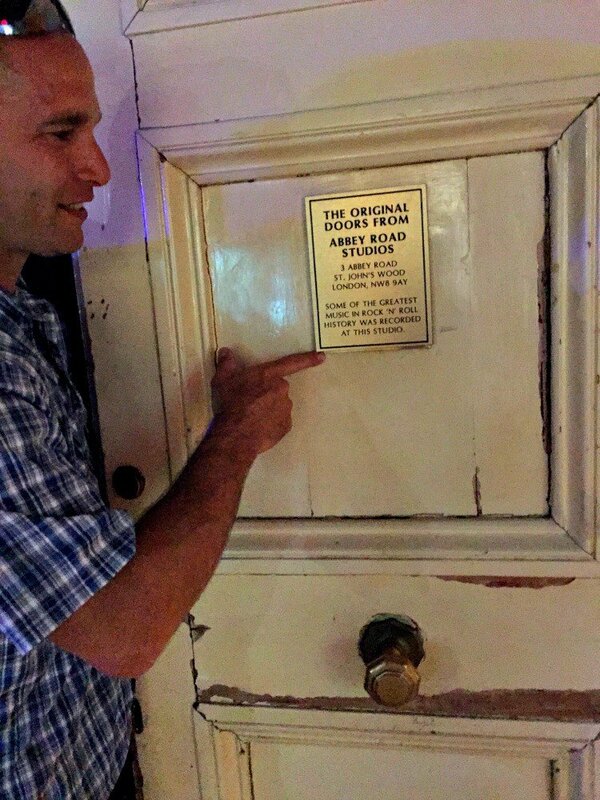 This is the original door from Abbey Road studios in London where some of the greatest music in rock n roll history was recorded. 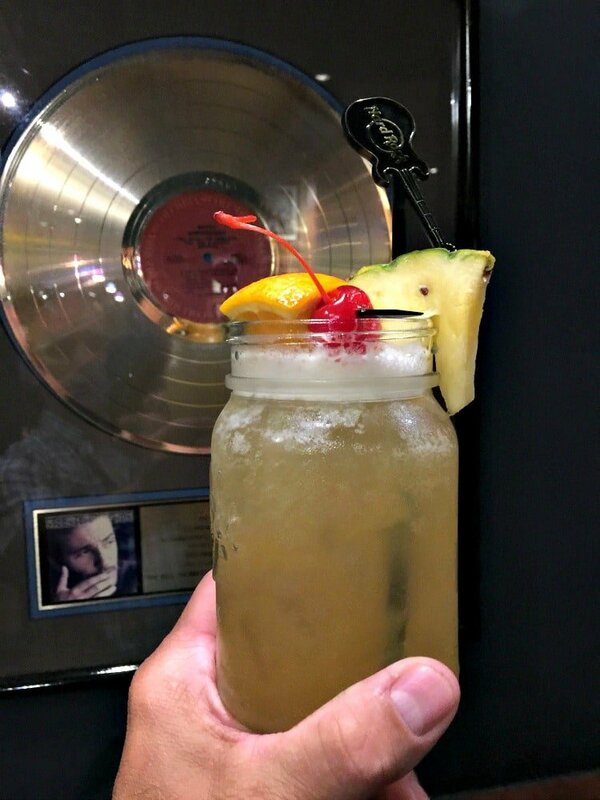 And then not too far away from that I saw some Springsteen…I had to raise my All Jacked Up Cocktail and toast to that one. The picture on the far right is the top of the marquis in Times Square where the ball drops on New Years Eve, very cool. I was told that you can rent this space out for parties for a small fortune. The view was pretty amazing so let me know if any of you decide to do that…I’ll bring the cocktails! 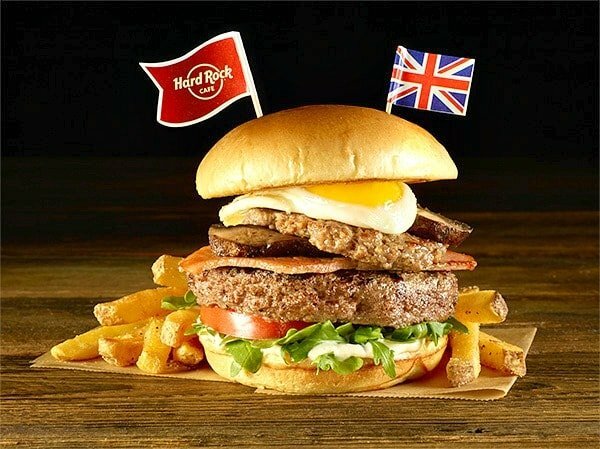 But if you find yourself in the area of a Hard Rock Cafe, or even if you’re nowhere near the area…definitely head over and check out the World Burger Tour at Hard Rock Cafe this month and see what your favorites are! 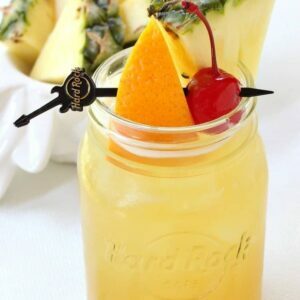 Mix pineapple juice, spiced rum, whiskey, Orgeat and lime juice in a shaker, and pour over ice. 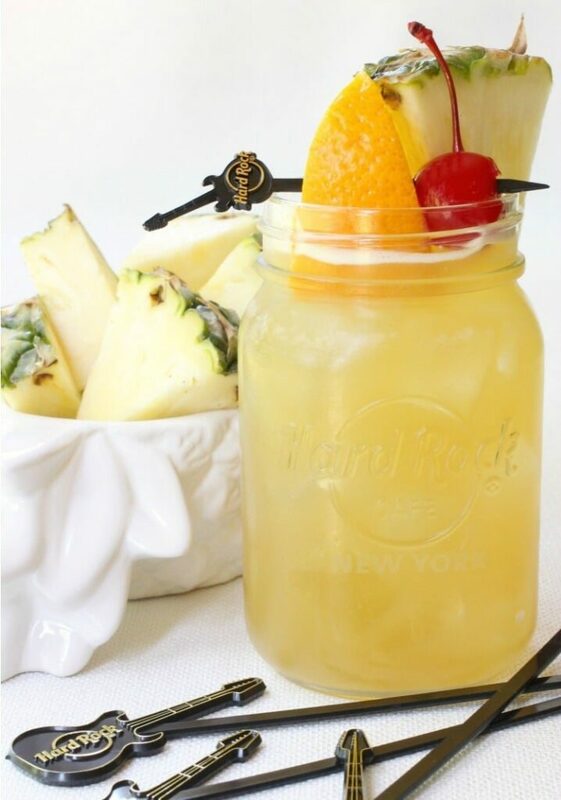 Garnish with a pineapple wedge and speared orange wedge and cherry.